Hydrogen is considered as a unique choice for future world’s resources. The important parameter in the process of hydrogen production is the value of reduction potential for the used catalyst, in direct contact with consumed energy in process. The application of computational methods to design and modify molecular catalysts is highly regarded. 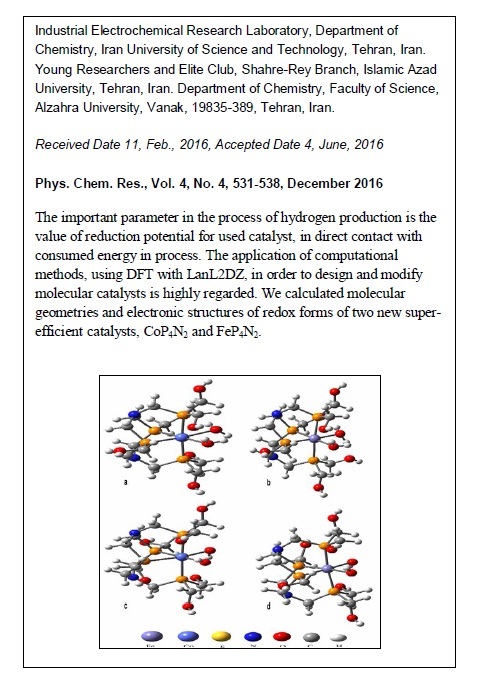 This study sought to explore Density Functional Theory (DFT), employing an effective core potential basis set (LanL2DZ) for metals, as an applicable method used to calculate molecular geometries and electronic structures of the redox forms of two new super-efficient catalysts, CoP4N2 and FeP4N2. The reduction potential related to CoP4N2 catalyst in the presence of water solvent is measured using a reference isodesmic reaction. 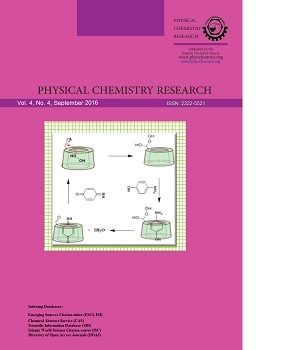 The calculated data revealed that obtained theoretical value for the reduction potential of catalyst, -0.58V, is in an excellent agreement with its experimental value, -0.50 V. The results confirmed that water molecules coordinated with Co or Fe core in catalyst structure play the main role in H2 gas production.